The picture shows steam turbine velocity diagram.The upper portion represents the inlet condition of steam and lower portion represents the outlet portion of steam. Let the steam jet is coming from nozzle P. After that it entering a curved blade and leaving the nozzle at C .The jet glides over the inside surface and leaves the blade at D. Let us draw the steam turbine velocity diagram.Assume, it creates at an angle a to the tangent of the wheel with a velocity V1 which is the absolute velocity of steam. This absolute velocity V1 has two components. One tangential component Vw1 and another axial component Vf1.Here Vw1 denotes the velocity of whirl at entry of moving blades and since it is the same direction of the motion of moving blades so it is the actual component which does work on blades.Vf1 is the velocity of flow at entrance, so it is perpendicular to the direction of blade's motion and it does not any work, but this is the component which is fully responsible for flow of steam through the turbine. Now moving blades start to move at a tangential velocity V in the horizontal direction and the jet of steam is V1 velocity create an angle a to the some horizontal direction. So both moving blades and jet of steam are moving in the same direction and steam enter the moving blades with a relative velocity Vr which can be found by subtracting the V and V1 component and assume it create some angle T1. For smooth flowing of steam when passing the moving blades, the jet of steam enter the moving blade's tip and it also creates some angle of moving blade T. T and T1 are same.When T1 and T will be same the steam's flow will smoothly strike the moving blades. In actual practice T and Tthita1 is same and that’s why we denote it T.
Similarly suffix 2 represents the outlet velocity of steam. Here steam leaving from moving blades at an angle β which makes with the tangent of the wheel with a velocity V2 and it is the absolute velocity of steam leaving of moving blades. This velocity V2 has two components. One Vw2 which is tangential component and another is Vf2 which is axial component. Vw2 is the velocity component of whirl to exit and it is the actual component for which steam leaving from the moving blades. Vf2 is flow component and it is responsible for velocity of flow of steam to exit. 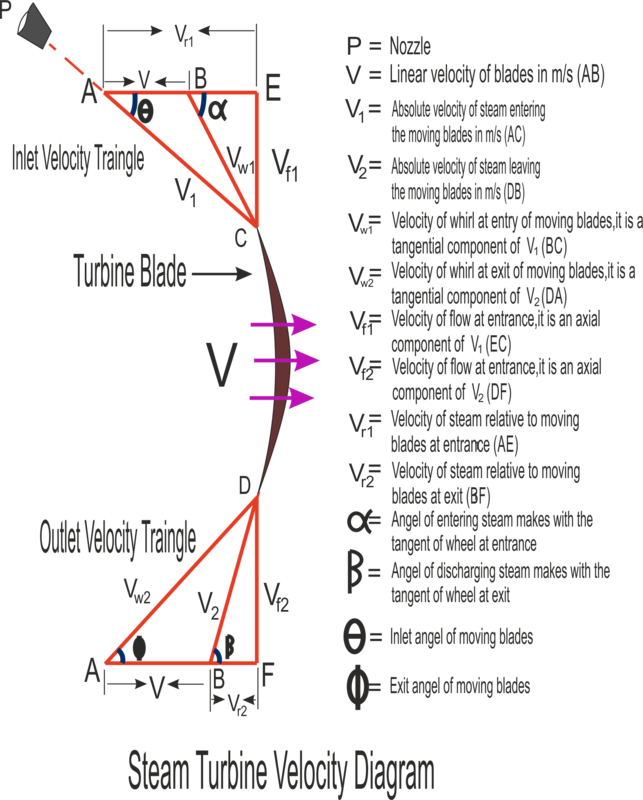 The moving blades are running at horizontal direction with a tangential velocity V and V2 the absolute velocity of steam leaving of moving blades create an angle β with a relative velocity Vr2 to moving the blade to exit. This Vr2 can be obtain by subtracting the V and V2 and it create some angle F1.But for smooth flowing of the steam while existing, it creates an angle of moving blades i.e.F. Now F and F1 are same. So, we denote it F. When F1 is equal to F then steam exit smoothly and steadily. 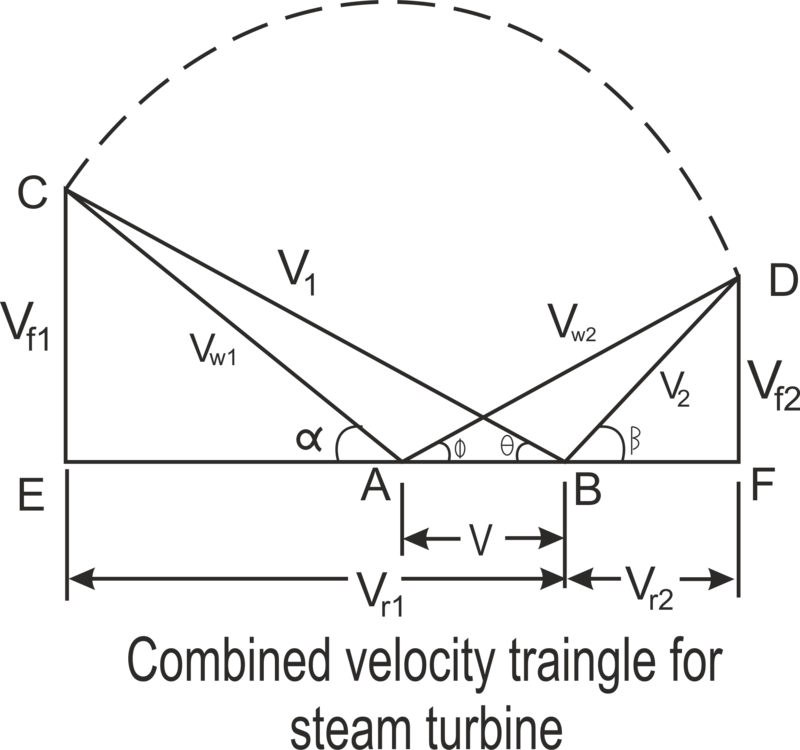 The picture shows combined velocity triangle of steam turbine.